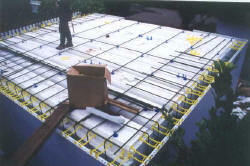 Quad-Deck is a very fast & versatile forming and insulation system for suspended concrete floors and roofs. It provides superior heat and airborne noise insulating qualities. What is Quad-Deck made of? Quad-Deck panels are made of Expanded Polystyrene (EPS) and have integrated steel beams molded into the panel that create formwork for the support of concrete, reinforcement, and construction loads with minimal shoring. What are the sizes of Quad-Deck? Quad-Deck is available in 7 different thicknesses (7", 8", 9", 10",11", 12" and 12.5"), creating concrete beam depths of 5" to 10.5". It is custom cut at the factory to the lengths required for your building project, eliminating waste in labor and materials. Depending on the project's requirements, Quad-Deck offers R-values ranging from R-16 to R-33. How far of a span can I build? 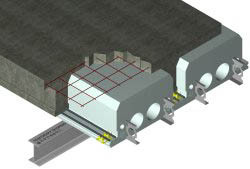 Quad-Deck can be used to achieve up to about 33 foot clear spans with low live loads and regular construction methods. For longer spans, other secondary structural support may be required; e.g. column-supported beams, slab bands, girders. Increased beam heights using additional EPS on the Quad-Deck and Post-Tensioning can also be used to extend the spans and/or live loads. The structural engineer who will determine the thickness, allowable span and required reinforcing for any project. We can provide the tables that will suggest allowable spans. See Technical Summary. How is Quad-Deck supported during construction? Quad-Deck needs to be supported underneath with typical shoring, usually about 6 feet apart. The structural engineer or shoring engineer (often provided for free with shoring rentals) is responsible for the correct layout and specifications. Quad-Deck acts as its own formwork so no falsework/ plywood is required which makes Quad-Deck quick to install - saving on installation and stripping labour. What is the cost of Quad-Deck? Please contact us, preferably with your floor plans and live loads, for an initial estimate.